The Bermuda Gymnastics Association announced that Bermuda has earned a slot in the 2015 Pan American Games for artistic gymnastics. 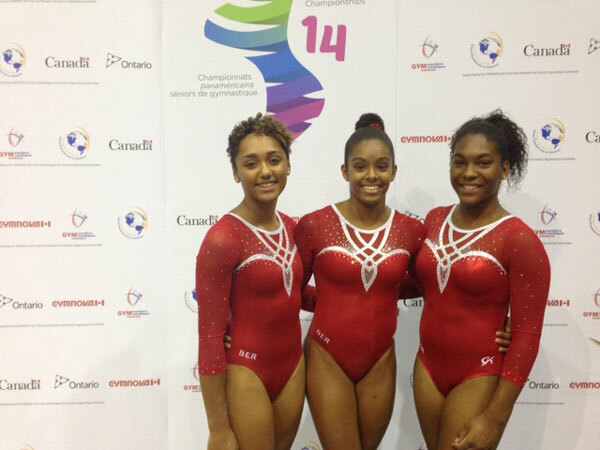 Three Bermuda gymnasts traveled to Toronto to compete in the Pan American Championship, the qualifying event for the Games. Sydney Mason [16, BHS], Gabby Vincent [17, Warwick Academy] and Zantae Dill [15, Saltus] took on the best gymnasts from across USA, Canada, and 19 other Caribbean, Central American, and South American countries. Mason was Bermuda’s top finisher, earning her personal best on uneven bars on her way to finishing 51st with a 39.55. Dill and Vincent finished 60th and 63rd, respectively. Head coach Duke Nelligan said, “Sydney, Gabby and Zantae rose to the challenge of competing on a major international stage. “The level of competition in the Pan American region is extremely high. There were numerous Olympians participating, and dozens of rising stars who are looking for a spot at the 2016 Olympic Games. “Our job was to perform clean routines, earn a spot for Pan Am Games, and soak up every bit of the experience so that next time we are even more prepared. Left to Right: Gabby Vincent, Zantae Dill, and Sydney Mason. The dedicated student athletes, who balance full time schooling with up to 20 hours a week of training, will return to competition in November. The Bermuda Gymnastics Association is set to host its annual International Gymnastics Challenge at the National Training Center in St. Davids on November 8th, and the following week, two of the three young women will travel to Mexico to compete in the Central American and Caribbean Games.